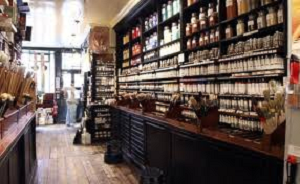 Cornelissen’s has been in business since 1855 and supplies Professional artists and amateurs with pigments, paints, brushes, boards and gilding equipment. 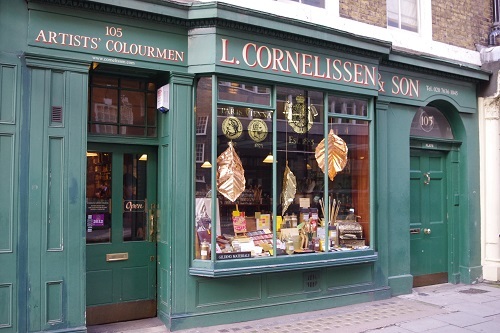 Louis Cornelissen, the founder of the business, is said to have been a Belgian lithographer , setting up in Drury Lane, initially dealing in lithographic colours and supplies, and reputedly moving to Great Queen St in 1855 Cornelissen was first listed as an artists’ colourman in 1881. Cornelissen provided marked canvases and stretchers for works by many famous artists including Rex Whistler, W.R. Sickert was a regular customer as was Aubrey Beardsley. 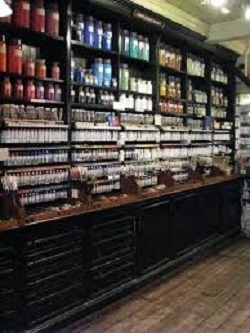 The family part of the business ended in 1977 at the death of Len Cornelissen, the last in the family, but was reopened in 1979 by Nicholas Walt moving from historical premises in Great Queen St to shop premises at Great Russell St.
Its shelves are stacked with bottles of paint pigments and traditional artist’s materials and tend to have access to supplies not easily available elsewhere. 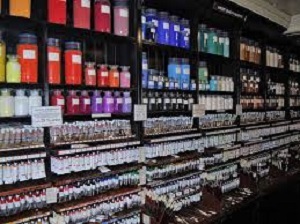 The friendly and knowledgeable staff offer a wide range of advice on artist and painting equipment that fill the antique shelves.